He recreated the iconic renaissance art on the white frosty canvas using nothing but a hockey stick and a shovel! And the results have wowed people around the globe. Greenfield joked that his artwork deserves a place in Igloouvre. Leonardo da Vinci’s famous painting Mona Lisa has inspired zillions of artworks around the globe for decades. Now, after quirky creations using rice crackers and slices of bread, a Canadian man’s creation on an ice rink is going viral. Robert Greenfield from Toronto flaunted his artistic side in the cold weather and turned his backyard ice rink into a masterpiece after fresh snow blanketed his home. He recreated the iconic renaissance art on the white frosty canvas using nothing but a hockey stick and a shovel! And the results have wowed people around the globe. 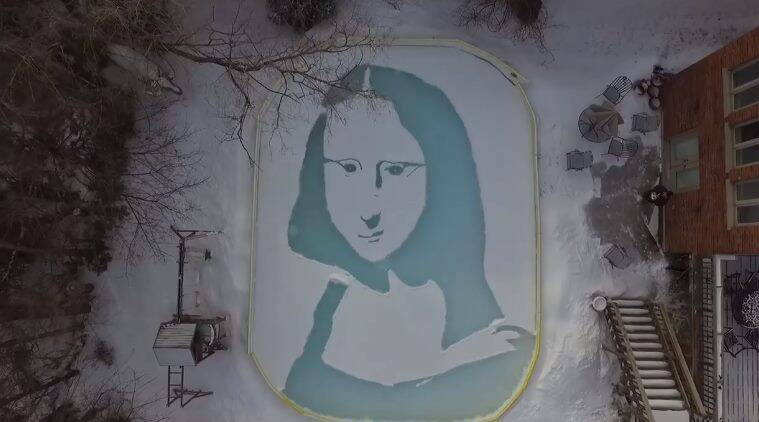 Greenfield shared a time-lapse video of his masterwork, calling his creation “Snowna Lisa,” on Facebook and garnered a lot of positive feedback. Posting the video, he jokingly wrote that he thinks his masterpiece should earn a place igloo version of the Louvre Museum! “This is not exactly a masterpiece, but I present the Snowna Lisa! Oh, you think that’s bad? Wait till I tell you it should be hanging in the Igloouvre,” he wrote online. Greenfield has experience in creating masterpieces on the ice rink and his Facebook profile is filled with many such artwork videos.